I would like to thank everyone who attended the February Make A Blanket Day. We collect 89 blankets, distributed a lot of fabric, and generally had a very good time. Shout out to the label and tag packet ladies. Thank you to Marcia for helping in the kitchen. Pat, Marilyn, and Sharon thank you for helping at the check in table and helping the new blanketeers to feel welcome. We will be having a monthly blanketeer workshop the second Saturday of every month from 1:30 to 3:30 at Sherwood Assisted Living. The address is 550 West Hendrickson Road in Sequim. Next gathering is December 10th! Bring your supplies and stitching machines. Tables will be provided. If you click here it will open a Google Map showing you were the facility is. If you belong to an organization that would like their Project Linus information posted on our web site please ﻿email me﻿. 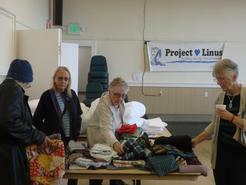 With 37 volunteers coming to the Gardiner Community Center for the Make a Difference day we had 252 blankets turned in. I will be taking them to the Children's Hospital Monday Oct.24th. Thank you so much for your dedication and devotion to making such beautiful creations of love and security for the children.